0 Comments Published by Cedric Benetti on Wednesday, December 9, 2009 at 12/09/2009 10:18:00 PM. 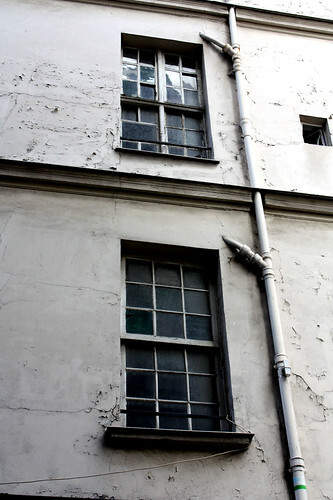 A mysterious set of windows can be found on this old building in the Sentier area. The one on the top are typical French windows, possibly still from the late 18th century, whereas the bottom window is a sash-window, more commonly used in the UK and the US. Quite possibly someone imported his own windows while moving across the Channel in order to feel more at home, or someone must have specialized in producing sash windows in Paris somewhere in the 19th century.